Gravity, constant facial movements, and heredity all play a role in the development of your facial features. As time progresses, your skin and underlying muscles become lax, causing cheeks to droop and jowls to form. These age-related changes can create an imbalance in your facial profile and leave you feeling self-conscious. Dr. Nelson offers both surgical and non-surgical options to augment your chin, cheeks, and jawline in order to enhance the shape of your face and build your confidence. 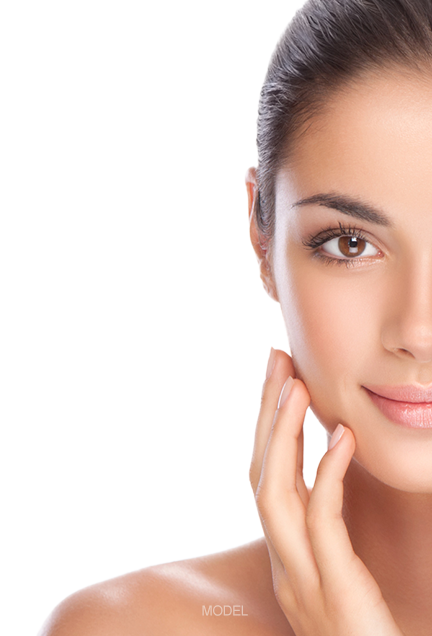 Fillers offer non-surgical options for chin, cheek, and jaw augmentation. They contour the face by adding volume to areas that have hollowed or lack projection and definition. They can also mask the appearance of jowls. We offer several filler products, including Sculptra® Aesthetic, RADIESSE®, JUVÉDERM VOLUMA® XC, and Restylane® Lyft™. Injectable fillers can last from one and a half to two years. While there are many options to choose from, new fillers are approved every year, and there is no need to worry about learning about every type of filler. Dr. Nelson can help you decide which filler is best during your consultation. Fat grafting borrows fat from a donor area (such as the abdomen, thighs, hips, or buttocks) to enhance your desired facial area. Since the augmenting material is your own fat, there is no chance of rejection or allergic complications. Fat grafting can enhance the cheeks, chin, and jawline to promote facial balance and harmony, giving you a more defined and confidence-enhancing profile. The most permanent facial augmentation comes in the form of facial implants. Implants can lift and enhance sagging or depressed cheeks, augment an aging jawline, or aid in the projection of an under-developed chin. Dr. Nelson offers silicone implants in a variety of sizes, shapes, and styles. Unlike fillers and fat grafting, implants will not be absorbed or changed with time, and the results are permanent. The longevity of your results is directly related to the augmenting material. Even long-lasting fillers are considered to be temporary solutions. For example, Sculptra® Aesthetic injections are known to last over two years, whereas RADIESSE® can last up to a year. Fat grafting is long lasting; however, your body may absorb some of the transferred fat, and an additional grafting procedure may be recommended. The results of implants are permanent for the duration that you have them. It should, however, be known that none of these options will prevent or slow the natural aging process. What kind of anesthesia will be used for facial implants? Facial implant surgery is performed under general anesthesia or local anesthesia with sedation to ensure a painless procedure. You may experience some swelling, bruising, and tenderness in the injection or incision areas. These will generally subside after a few days, and makeup can be worn to mask any lingering redness. Your cheeks, chin, or jaw may be wrapped in dressings and bandages to support the implant(s). You should expect to take a couple of days off of work and refrain from any vigorous exercise or movement. Any discomfort can be remedied with over-the-counter pain medication. What are the risks associated with facial augmentation? Candidates for cheek, chin, and jaw augmentation should be in good general health and have realistic expectations about their results. You will be required to stop smoking six weeks before your procedure to minimize the risk of complications during and after your augmentation. Which augmentation option is right for me? All three of these options can restore balance and harmony to the face. During your consultation, Dr. Nelson will listen to your concerns and examine your facial anatomy to determine which option is ideal for you.